The franchise was founded by Leonard Bloom as the ABA’s first—and as it turned out, only—expansion team. But a feud between Bloom and Peter Graham, manager of the city-owned 14,400 seat San Diego Sports Arena, led Graham to lock the newborn team out of the facility for two years. By the time the conflict was resolved in the fall of 1974, it was too late for a weakened franchise that had been forced to play, in the interim, at such bandboxes as Peterson Gym (3,200 seats) and Golden Hall (sports venue), a multipurpose facility. 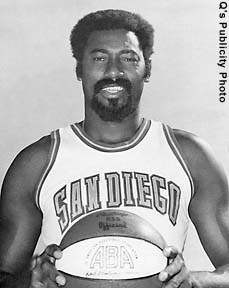 After reaching the 1973 ABA Playoffs in their inaugural season, the Q’s seemingly pulled off a coup by paying center Wilt Chamberlain $600,000 to become their player-coach. But the Los Angeles Lakers sued to block their former star from playing for his new team. Relegated to a sideline role, Chamberlain was reduced to an indifferent, 7-foot-1-inch sideshow who once skipped a game in favor of an autograph session for his recently published autobiography. (His fill-in, on that and other occasions, was Stan Albeck, who later skippered the Chicago Bulls, San Antonio Spurs and New Jersey Nets of the NBA.) Nonetheless, the team again reached the postseason, bowing out in the first round, for the second year in a row, in the 1974 ABA Playoffs. Originally called the San Diego Conquistadors (popularly known as the "Q's"), they played from 1972 to 1975. The franchise was founded by Leonard Bloom as the ABA's first—and as it turned out, only - expansion team. But a feud between Bloom and Peter Graham, manager of the city-owned 14,400 seat San Diego Sports Arena, led Graham to lock the newborn team out of the facility for two years. By the time the conflict was resolved in the fall of 1974, it was too late for a weakened franchise that had been forced to play, in the interim, at such bandboxes as Peterson Gym (3,200 seats) and Golden Hall (sports venue), a multipurpose facility. Conquistadors – The name derives from a small group of adventurers who took part in the Spanish conquest of South and Central America in the 16th century. Who is the greatest San Diego Conquistadors? 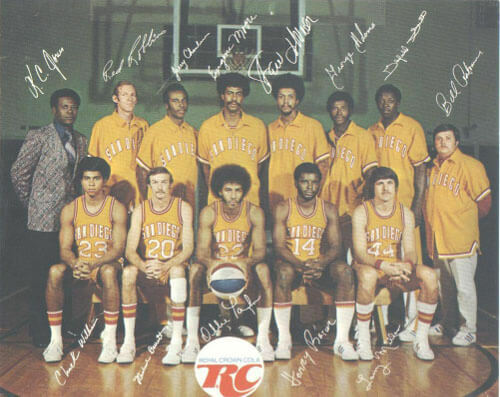 Called the San Diego Conquistadors (popularly known as the "Q's"), they played from 1972 to 1975.